Yukinori Yanagi, Untitled (Submarine), 2013, oil on tin, 7 x 11 x 3 1/2”. Japanese neo-Pop pioneer Yukinori Yanagi has had relatively low international visibility in recent years. After his definitive return to Japan from New York in 2000, his work took on an altogether different scale, both temporally and spatially, involving the artistic transformation of industrially despoiled, semiabandoned volcanic islands in Japan’s Inland Sea. The pieces in this exhibition are windows to a vastly ambitious new endeavor: the Art Base Momoshima project, commenced in November 2012 in a former junior high school on a small island near Hiroshima. Using oil, graphite, and emulsion on photographic prints of Momoshima, Yanagi sketches pieces of ships floating on barges, creating a surreal still life of the region’s decaying industrial base. 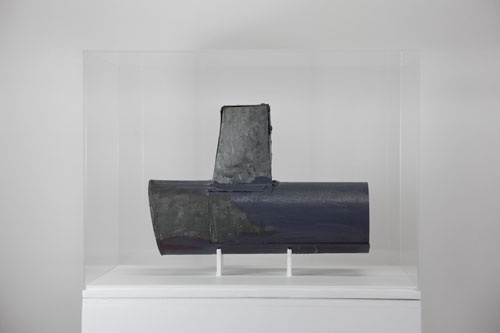 These works are accompanied by a small rough-hewn sculpture, Untitled (Submarine), 2013, made from pieces of metal found on the island; also nearby are images of the battered 1950s movie theater in the village, reimagined as a temple of failed modernity. Pictured onstage, a projection of Yanagi’s signature neon hinomaru (Japanese flag) articulates his critique of crumbling nationalism, alongside a wry nostalgia for the postwar boom years. Momoshima was once a thriving community based on orange farming, teeming with family life. It is now a certifiable genkai shūraku, a settlement doomed to die out. Today the population is around 550 and falling, 70 percent of the residents are over sixty years old, and desperately few children are living on the island. From the survivalist-style Art Base, Yanagi and several young associates are plotting a temporary revitalization of the island, nursing it toward an inevitable future through a kind of slow art. A recent group show curated by the Berlin-based artist Taro Furukata (“100 Ideas on Tomorrow’s Island – What Art Can Do for a Better Society”) inspired German and Japanese artists-in-residence to clear several abandoned homes and convert them into repositories of memory. The resultant trail of discovery transformed the whole village into an eerie Gesamtkunstwerk. Amid empty shacks, rusting Toyotas, and villagers outnumbered by crows, cats, and spiders, the Momoshima project quietly explores postindustrial collapse and social decline—a possible future for any society in which development is based only on illusions of endless economic growth.